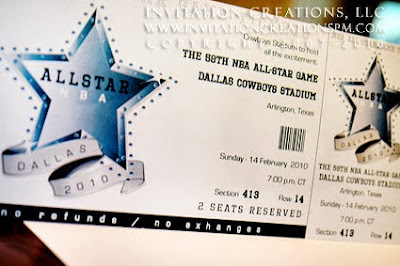 So a previous client approached me about this Christmas gift she wanted to give her husband, NBA All-Star Tickets. Cool gift, huh? Since she wouldn't have the tickets in her hand by Christmas she asked if I could design something she could give him as a stand-in. Since this was a departure of my typical projects, I went for it. Here is the final product. From what she tells me, he loved it and thought they were the actual tickets!